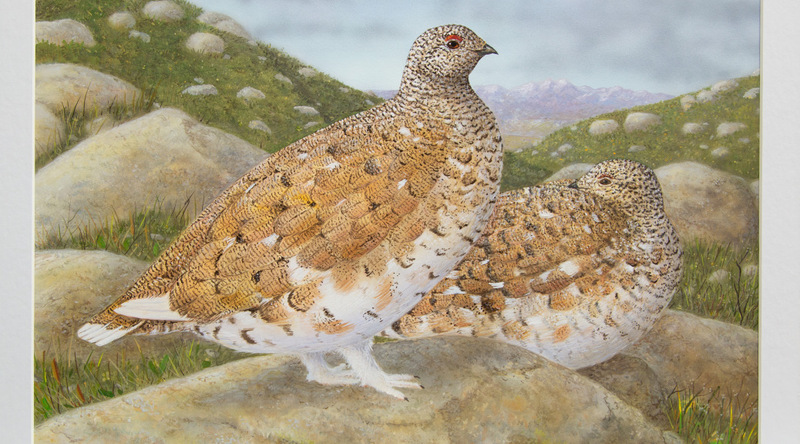 A painting of a pair of white-tailed ptarmigans has been chosen by a panel of judges as the winning entry in the 2018-2019 California Upland Game Bird Stamp Art Contest. The painting was created by Jeffrey Klinefelter of Etna Green, Ind. Sponsored by the California Department of Fish and Wildlife (CDFW), the annual contest determined the official design for this year’s California Upland Game Bird Stamp. Klinefelter also captured the top spots in the 2011-12 and 2017-18 Upland Game Bird Stamp Art Contests, as well as the 2009-10 California Duck Stamp Contest. Artists submitted an original depiction of white-tailed ptarmigan (Lagopus leucura). This smallest of North American grouse species exhibits a dramatic change in plumage from a mottled or a barred brown-yellow during breeding in spring to a pure white during the winter months, allowing this chameleon of the bird world excellent camouflage on the ground year-round in its alpine habitat. The individual artists determined the setting and details, but paintings had to include at least one white-tailed ptarmigan and accurately represent the species’ natural habitat in California if a background was included. The entries were judged recently by a panel of experts selected for their knowledge in the fields of ornithology, conservation, art and printing. Designs were judged on originality, artistic composition, anatomical accuracy and suitability for reproduction as a stamp and print. The panel cited the anatomical accuracy of Klinefelter’s painting in a setting depicting the white-tailed ptarmigan’s habitat, with one judge praising its “overall quality and attention to detail.” Klinefelter explained that his decision to depict the white-tailed ptarmigans when they were changing color added a degree of difficulty but paid off in the end. Broderick Crawford of Clayton, Ga., placed second, Erik Fleet of Julian (San Diego County) placed third and Michael Carmickle of Eugene, Ore. received honorable mention. An upland game bird validation is required for hunting migratory and resident upland game birds in California. The validation replaces the stamp through CDFW’s Automated License Data System, but the stamp is still produced and available to hunters upon request. Monies generated from upland game bird validation sales are dedicated solely to upland game bird-related conservation projects, hunting opportunities and outreach and education. CDFW annually sells about 170,000 upland game bird validations and distributes approximately 17,000 stamps. Any individual who purchases an upland game bird validation may request their free collectable stamp by visiting www.wildlife.ca.gov/licensing/collector-stamps. An order form is also available on the website for collectors who do not purchase a hunting license or upland game bird validation, or for hunters who wish to purchase additional collectible stamps.